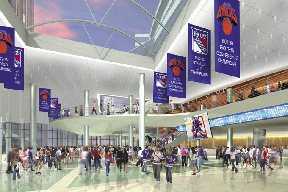 Madison Square Garden has secured one of the world's leading real estate and facility management companies in the world, Jones Lang LaSalle, as the overall project manager for the arena's renovation project, slated to begin construction in spring, 2009. As project manager, Jones Lang LaSalle will work with the Garden to oversee all aspects of the renovation, from managing related personnel to establishing and managing the project's timeline, to creation of the overall budget and financial controls, to coordinating the activities of several dozen consultants and construction partners over the renovation period. Madison Square Garden has also selected international construction leader, Skanska, as construction manager for the arena's renovation project. Â Skanska will be responsible for pre-construction and construction management services throughout the project in conjunction with Jones Lang LaSalle. The Madison Square Garden renovation is a $500 million construction project that will transform the current Garden into a state-of-the-art venue that will enhance the experience of customers, sponsors, entertainers and athletes. 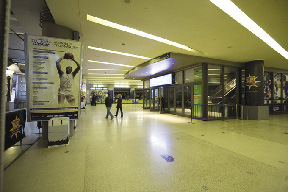 Â Utilizing existing space on the Garden's current footprint, the renovation will enhance all customer-related areas, including a dramatically redesigned 7th Ave. entrance; new, more comfortable seats, with significantly better sightlines; new, wider and more spacious public concourses open to the arena bowl, with spectacular views to the city; state-of-the-art lighting, sound and LED video systems in HDTV; new food and beverage options and a greater selection in all hospitality areas; 68 new mid-level suites that are 50% larger than current suites and half the distance to events; 20 new floor-level suites that are on the same level as the playing surface and provide direct access to the best seats in the house; improved dressing rooms, locker rooms, green rooms and production offices for athletes and performers; a new fan party deck in the upper level with expanded and improved hospitality areas that replace the existing upper suites; many additional new restrooms, with 50% more dedicated space and restoration of MSG's world famous ceiling. Brisbin Brook Beynon is the project's architect.